Actually there had been no Japanese submarine or surface vessels anywhere near the west coast during the preceding month, and careful investigation subsequently indicated that all claims of hostile shore-to-ship and ship-to-shore communication lacked any foundation whatsoever.16 Similar recommendations for restricted areas in Arizona, Oregon, and Washington followed, and were forwarded to Justice by 3 February.17 By then the position of the Japanese population was under heavy attack, and in consequence the alien exclusion program was being eclipsed by a drive to evacuate all people of Japanese descent from the west coast states. execution of this recommendation would have required the evacuation of about 10,700 additional enemy aliens and, as in the case of California, only about 40 percent of these would have been Japanese. As a practical matter the Department of justice would have found it extremely difficult to supply either the manpower or the internment facilities that a compulsory evacuation of 17,000 or 18,000 enemy aliens would have required, and by 4 February its representatives were intimating that, if there were any further Category A recommendations or if the evacuation of any citizens were to be involved, justice would have to bow out and turn its evacuation responsibilities over to the War Department. General DeWitt on 4 February was considering putting the whole Los Angeles area into Category A, because his Air commander had recommended Category A zones around 220 different installations that, when plotted on the map, almost blanketed the area anyway. For the same reason, General DeWitt believed he might have to put all of San Diego in Category A also.50 He finally recommended the blanket Category A coverage of these two cities on 7 February, and five days later he recommended that almost all of the San Francisco Bay area be put in Category A. If all of General DeWitt's recommendations for Category A areas through 12 February had been accepted, it would have made necessary the evacuation of nearly 89,000 enemy aliens from areas along the Pacific coast-only 25,000 of whom would have been Japanese.51 Additionally, of course, General DeWitt was counting upon the California state authorities to persuade the citizen Japanese to evacuate California's urban areas and other sensitive points along the coast. On 9 February Attorney General Biddle formally agreed to announce the Category A areas initially recommended for Arizona, California, Oregon. We further recommend that such areas be enlarged as expeditiously as possible until they shall encompass the entire strategic area of the states of California, Oregon and Washington, and Territory of Alaska. As already noted, the plan for evacuation embodied in the War Department's directives of 20 February differed materially from the plan recommended by General DeWitt in his memorandum of 13 February. The central objective of the DeWitt plan was to move all enemy aliens and American­born Japanese out of all Category A areas in California, Oregon, and Washington that the general had recommended through 12 February. Although General DeWitt had repeatedly described the Japanese as the most dangerous element of the west coast population, he also made it clear as late as 17 February that he was "opposed to any preferential treatment to any alien irrespective of race," and therefore that he wanted German and Italian aliens as well as all Japanese evacuated from Category A areas.73 His plan assumed that all enemy aliens would be interned under guard outside the Western Defense Command, at least until arrangements could be made for their resettlement. Citizen evacuees would either accept internment voluntarily or relocate themselves with such assistance as state and federal agencies might offer. Although this group would be permitted to resettle in Category B areas within the coastal zone, General DeWitt clearly preferred that they move inland. War except on an individual basis. Although the War Department -plan ostensibly provided that German aliens were to be treated in the same manner as the Japanese, it qualified this intention by providing for the exemption of "bona fide" German refugees. This qualification automatically stayed the evacuation of German aliens until General DeWitt could discover who among them were genuine refugees. The War Department plan contemplated voluntary relocation by all types of evacuees to the maximum extent possible, with internment as necessary outside the Western Defense Command. Another major difference between the two plans was related to General DeWitt's recommendation of a licensing system for Category A areas; the President's Executive order of 19 February did not require the application of the licensing plan, and licensing was not embodied in the War Department's directives of 20 February. There were other lesser differences between the two plans. General DeWitt had recommended that before any evacuation all preparations should be complete, including the "selection and establishment of internment facilities in the Sixth, Seventh, and Eighth Corps Areas." As already noted, the War Department at this time was also planning to put all internees east of the Ninth Corps Area, but its directives did not contemplate any postponement of evacuation until internment facilities were ready. General DeWitt had also recommended the initial and separate internment of all enemy alien males over 14 years of age, until family units could be established in internment camps. The War Department plan had no such provision. As for the number of people to be involved, General DeWitt's memorandum contained an estimate that 133,000 people would have to be evacuated either voluntarily or by compulsion. A breakdown of this figure (based on his previous Category A recommendations) discloses that his plan would have involved about 69,000 Japanese (25,000 aliens and 44,000 American citizens), about 44,000 Italians, and about 20,000 Germans. The War Department planners apparently made no estimate of the numbers that their directives would involve, but eventually they did involve more than 110,000 Japanese residents-citizens and aliens-of the west coast states. the west coast, General DeWitt, on 10 March, established a Civil Affairs Division in his general staff, and, on the following day, a Wartime Civil Control Administration to act as his operations agency for carrying out the evacuation program. At Mr. McCloy's urging, and with General Marshall's approval, Colonel Bendetsen was formally transferred from the War Department staff and made chief of both agencies.86 These agencies and the War Relocation Authority provided the administrative means for handling a controlled rather than voluntary evacuation. 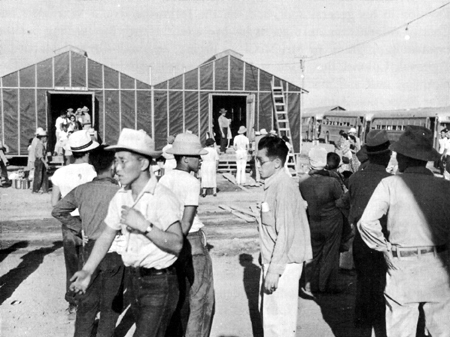 JAPANESE EVACUEES ARRIVE AT THE COLORADO RIVER RELOCATION CENTER, Poston, Ariz. So far as concerns the mission [of the Western Defense Command] of protecting against sabotage and the evacuation of German and Italian aliens, the accomplishment of the mission should be started by a different approach. In the case of the Japanese, their oriental habits of life, their and our inability to assimilate biologically, and, what is more important, our inability to distinguish the subverters and saboteurs from the rest of the mass made necessary their class evacuation on a horizontal basis. In the case of the Germans and the Italians, such mass evacuation is neither necessary nor desirable. There were better if less tangible grounds for suspecting that some of the Japanese people -citizens as well as aliens- would become disloyal in the event of a Japanese invasion. The Navy report of early February 1942 previously cited concluded that a very small minority (less than 3 percent) of alien and citizen Japanese were so fanatically loyal to Japan that they could be expected to act as saboteurs or enemy agents, and a somewhat larger minority might be passively disloyal, if given the opportunity.113 On similar grounds the War Relocation Authority concluded that "a selective evacuation of people of Japanese descent from the west coast military area was justified and administratively feasible in the spring of 1942," although it concluded also that a mass evacuation such as was actually carried out was never justified.114 But no military estimate after December 1941 forecast even the possibility of an invasion of the west coast by the Japanese in strength, and all disloyalty among the Japanese remained passive until after their removal to relocation centers.